BAILIES History of Southport reports the disaster in the following way. A mayoral ball was in progress in the Cambridge Hall on the stormy night of the 8th of December 1886, when the loud boom of the lifeboat gun interrupted the festivities. Then followed the worst disaster in British annals. An iron barque, the Mexico of Hamburg, outward bound from Liverpool with a mixed cargo, had been driven on to the Ainsdale sands and appeared likely to become a total wreck. In worsening weather the lifeboats Eliza Fernley of Southport and Laura Janet of St. Annes put out to the rescue. Neither boats appears to have reached the vessel, although the former approached so close that according to the narrative of the two survivors, one of the lifeboatmen was about to throw a line but at this moment their boat swung broadside on to the sea and a huge mountain of water lifted it up and turned it completely over, burying the majority of its; crew beneath it. How the St Annes boat came to grief is not known, for there were no survivors. It was discovered about noon the next day, without mast, sails or anchor, opposite the Palace Hotel, out on the Birkdale shore. It was conjectured, from the place where the mast and sails were afterwards found, to have capsized with sails set when turning the corner of Spencer's Bank. Twenty-seven lifeboat men , fourteen of Southport and thirteen of St. Annes, perished. A third lifeboat, the Charles Biggs of Lytham, succeeded in reaching the Mexico and rescuing its crew of twelve. The Mexico was later refloated, sold for �.00 repaired and became a tourist attraction off Lytham St Annes, following this she completed a journey to the Falklands and back but was later lost in Scottish Waters in 1890. Total lives lost 27 all lifeboat men 13 St Annes 14 Southport, the worst lifeboat disaster there has ever been, far worst than the more recent Penlee disaster. The Botanic Gardens Museum in Churchtown Southport has a good display and a contemporary painting depicting the scene the morning after. "TITLE WARRIORS OF THE SEA"
Three crews await their Coxswains to face the hurricane. The stakes are death or duty, no man has answered No ! Lives must be saved out yonder, on the good ship Mexico. Did ever night look blacker, did sea so hiss before ! To fight a splended battle, manned by Warriors of the Sea. Leave sweethearts, wives and little ones when duty bids them go. That God will bless the lifeboat, and the Warriors of the Sea. The Mexico was an iron barque of some 400 tons, built at Sunderland in 1880; was sold to a London firm and named the Mexico, then after various sales finally belonged to Oetling Gebruder of Hamburg, and in 1886 stranded at Birkdale. The wreck was sold to a Preston firm for E45 Os. Od., towed to Preston and repaired, then for two years was a show ship moored off Lytham Pier. She was again sold and went on a voyage to the Falkland Isles. In 1889 she returned to London and in 1900 was totally lost at Tantallon. That was the last of that ill-fated ship. After the inquest and the B.O.T. 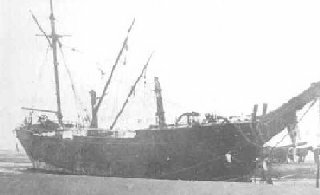 enquiry, the wreck of the Eliza Fernley was sent to London, and a similar " pulling boat " was sent in her place, the Mary Anna. The Eliza Fernley had been on the Southport Station for twelve years and in that time saved fifty-two lives. She had had two coxswains, the famous Wm. Rockliffe and Henry Hedge, who lost his life in her at the wreck of the Mexico. The following is a list of wrecks to which she was called out, and from which she rescued the fifty-two lives. The Mary Anna, the new lifeboat sent to replace the Eliza Fernley, was the first boat to occupy the new and splendid lifeboat house built by the Southport Corporation at the then boundary between Birkdale and Southport. This is currently the headquarters & home of Southport's inshore rescue craft. She was very like the Eliza Fernley was thirty-two feet long, with eight feet beam, and three feet five and a half inches deep. Where she differed was in having an iron keel three inches deeper and one would suppose that this gave her greater stability than the Eliza Fernley.